Rubber Room Ramblings: FREE OUTLINED OCCASIONS STAMP SET! 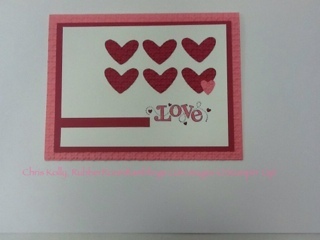 This is a really quick and easy card to make and it is perfect for lots of occasions. Just switch out any sentiment from the Outlined Occasions FREE Stamp Set (available in the Sale-A- Bration Catalog), and you are good to go. I also used my Stampin' Up! Heart to Heart Punch and the Square Lattice Embossing Folder for the Big Shot. ORDER YOUR STAMPIN' UP! PRODUCTS 24/7 HERE! I think it looks swell! You might crop it a little more but it's clear and cute! Did we make that card at last month's open house? ?